GROHE’s vision for the Sense and Sense Guard was to ensure that water is always a source of pleasure. Yet sometimes water is also a source of problems—leaks, blocked sinks, burst pipes and suddenly homeowners are confronted with a damaged home, ruined personal items and unexpected costs. 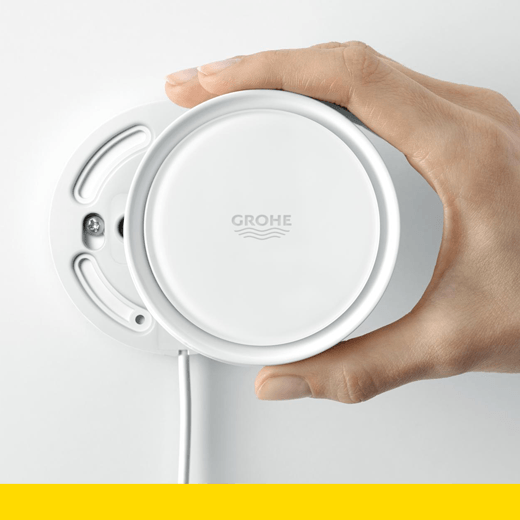 The GROHE Sense is a smart water sensor that detects water in your home. It is equipped with a range of intelligent functions to detect, sense and respond to the presence of water where it shouldn’t be. The GROHE Sense Guard is a smart water controller that detects smaller leaks and dripping taps and in the case of a burst pipe shuts off the water supply. Furthermore, it constantly measures and compares water pressure, temperature and flow with preset thresholds.